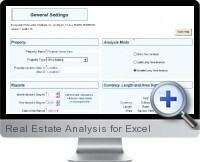 Real Estate Analysis for Excel is designed to quickly make professional presentations for residential or commercial real estate investment analysis ans valuation. Detailed Long-Term Analysis: Creates 10 year pro forma projections of income and expenses, rent roll, financing, cash flow before taxes, and resale. Evaluates key measures of return, such as internal rate of return (IRR), present value (PV) and cash on cash. Quick Long-Term Analysis: Completes a full but quick analysis of a property on a single worksheet. This saves time to evaluate if the property merits a more in depth analysis. Short-Term Analysis: Take a month by month approach to a proposed real estate investment or to renovate and resell within two years. Reparation and improvement costs can be projected for each month along with any rental income, operating expenses and debt payments. The analysis also estimates the potential profit on the property investment. Real Estate Analysis for Excel can be easily customized such as adding logos to reports with automatic resizing and optionally including a full page of property images and photos.